Ca l’Enric makes me think of the cold, game, mushrooms, the forest floor, and savoury truffle. Their fireplace and the woodcock spring to mind. It transports me to a rural setting that has been transformed to the 21st century and it makes me think of what it would have been like in the beginning. Even though the origins of the house dates back to 1910, I would like to go back to the 1990s, when the gastronomic benchmark in Catalonia was the now deceased Santi Santamaria from El Racó de Can Fabes; when inland, the kitchen of Toni Sala from la Fonda Sala became a flagship restaurant; and when in Barcelona, game dishes were cooked in the Gaig Restaurant in the Horta district, in the Neichel and in the always lordly Via Veneto. 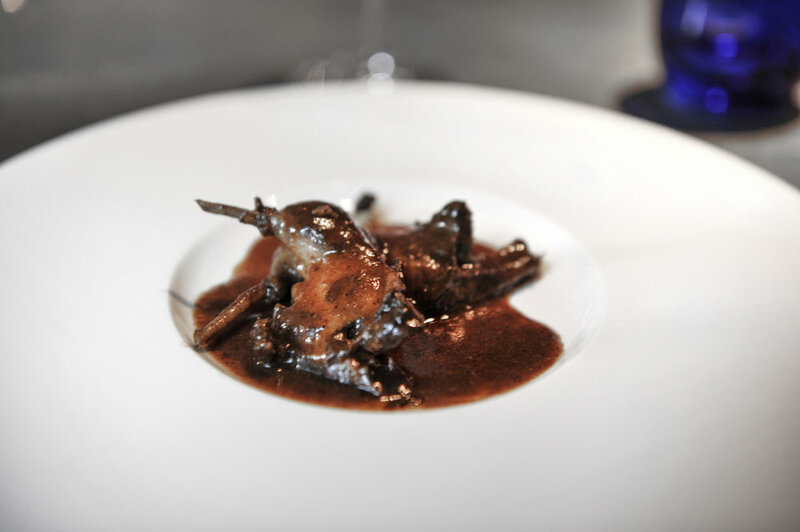 Under this gastronomic scene and with a strong game tradition in the region of La Garrotxa (Catalonia), the Juncà family served a menu of increasingly expensive fowl, the bécasse menu. They started to include woodcock in all the dishes on the menu allowing them to continue serving the bird at their restaurant. The woodcock is a stout migratory bird with short legs and has an extraordinarily subtle taste. Today we can have a lunch of bécasse from November to February, when we are able to use fresh pieces or with a certain faisandegée. The Juncà family structure a menu of woodcock in four unique dishes. Before explaining it allow me at least cite one of those snacks that makes you think you are starting a memorable lunch like the bunyol of bone marrow with caviar. Let’s focus on the bécasse menu. The first course is bécasse soup made with the bird’s carcass, chicken broth, bread and grated truffle. Starting an autumn-winter meal, based on woodcock, in the mountain and with a warm liquid is a proposal that everybody loves and that every day is more difficult to find in creative cuisine restaurants. The second service offers mountain rice made with the bird’s wings and head that also accompanied the dish. The third service, in which roasted thighs are presented, shows the balance between the intensity of the sauce and the texture of the meat. And, finally, the fourth course offers the grilled breasts irrigated with salmis. The salmis is a preparation or sauce made from the guts (one of the most appreciated parts of the bécasse), the carcass (the bones), wine and often the skin of the cooked bird to enhance the taste of the woodcock. Served with the appropriate degree of faisandegée, it results in an explosion of flavours and pure excitement of the game period. Obviously, besides these legendary dishes, the restaurant has offered other dishes with the bird like “the forest floor of the woodcock”, “the bécasse shower” or “the royal of bécasse with truffle and royal of sea urchin”. Even then, they have cooked a full menu with a vertical tasting of woodcocks. In other words, different woodcocks with different degrees of faisandegée. Apart from going to Ca l’Enric in autumn or winter, it is very interesting going in August or September to taste their seasonal menu of the small wild game closure based in other birds like quail nest, pickled turtle dove salad, turtle dove taco with sea cucumber, turtle dove soup with tuber uncinatum, wood pigeon rice and black olives and, finally, the wood pigeon (grilled breast and niguiri of Royal of wood pigeon with eel). Other memorable dishes that they cook with game animals and springs to mind are pickled partridge salad, hare à la royal, hare rice and the roe deer stew. 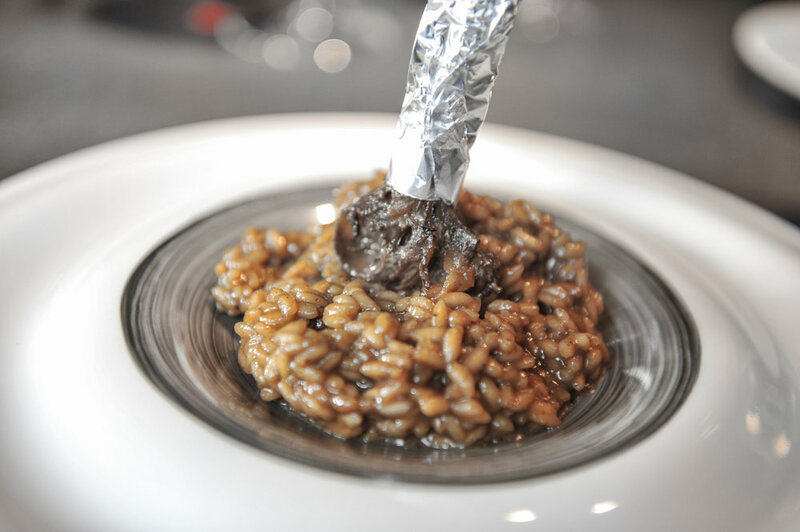 If there is a priced ingredient that is the faithful companion of game dishes, it is the black truffle or tuber melanosporum, a sublime product that the Juncà family have had the luck to acquire with relative ease and that we can find in their splendidly served recipes. Dishes like “anchovies with truffle and ricotta”, “perol sausage canapé with tuna and truffle” and “barbecued truffle” comes to mind. We can also eat truffles in desserts with “false truffle buried” and “the forest floor of truffles”. It is curious that I have never seen the Ca l’Enric wine list, but I would say that it is one of the better restaurants where I have drank and with the best quality glasses. In addition, there is nothing abusive about the price, allowing you to drink fine wines comfortably. From France, you can drink Burgundy wines as claimed around the world as a Meursault of Coche-Dury and a Vosne-Romanée Grand Cru such as La Grand Rue 2001 of Lamarche but also Savagnins from Jura region like a Château Chalon of Jean Macle or a Vin Jaune of the Château d’Arlay. Other wine families that Ca l’Enric has as a reference are the Perrin from Château de Beaucastel and the Chave with their Châteauneuf-du-Pape and Hermitage, respectively. But the always well-rated Savennières of Nicolas Joly are also present. From Italy, the Piamontese Nebbiolo red grape is another variety that excited Joan Juncà. It is just necessary to remember that some of the wines offered to me such as a Barolo Monfortino 1995 of Giacomo Conterno, a Barolo Bric del Fiasc 1997 of Paolo Scavino or a Barbaresco Rabajà 2001 of Bruno Rocca. It is unusual to find old wines in the restaurants but in Ca l’Enric they have the necessary sensibility to offer their clients wines of Emidio Pepe like the Montepulciano d’Abruzzo from 1975 or 1977. German Rieslings from producers such as Egon Müller, Fritz Haag, Von Schubert of Maximin Grünhaus or Dönnhoff are other wines and labels that immediately attract attention in the dark cellar of Ca l’Enric. Logically, a cellar like that of this house also considers the wines of its land and it is easy to find eating producers from Priorat, Empordà or Penedès. And the fact is that all these wines marry perfectly with the complexity of aromas, savours and textures that the different parts of the woodcock such as the head, the wings, the thighs, the breasts or the intestines offer. I hope that Ca l’Enric will not be forced to adapt to the Michelin criteria or to other trends to survive and, like other restaurants, lose their identity. I wish they maintain their original ideas and that one day we do not find a bécasse with wasabi, clear Scandinavian inspirations, a deconstruction of carrot cake or their version of piña colada, especially in the snacks and desserts that always seem more accessible for this type of play or diversion. I will pray for the Juncà’s typicity.